I started this site a number of years ago to share my love of making homemade dinners with others. I quickly learned that just because you build a site doesn't mean that loads and loads of people will find on the web. There are just too many sites. Bloggers, and business owners need to develop strategies to make sure their content and business can be discovered. I'm often asked how I drive traffic to my site and develop a loyal following. In addition to creating great content, using email marketing has been a key element to my success. I currently send out an e-newsletter to about 11,000 subscribers each week. My newsletters are brief, offer exclusive content that isn't always found on my website, and allow me to direct my followers to seasonal or topical information. It is also a very effective way of keeping my site on the radar of people who have expressed interest in my content and products. 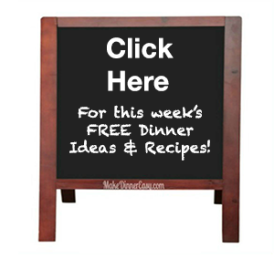 My primary goal is to notify my followers that my weekly dinner menus have been updated but I have other goals including driving traffic to seasonal recipe pages, letting them know of a contest I may be running on Facebook or directing them to a seasonal Pinterest Board or a related product that I'm selling. I have over 300 pages on my site. I know that I have a recipe for Irish Soda bread that would be great to make for St. Patrick's Day but my followers would never know that unless I have a vehicle to remind them, email marketing helps me accomplish that. I have sent over 300 newsletter editions out using three different email services. I can tell you that not all services are equal. Although I used several services including Constant Contact, I had many problems including complaints that subscribers weren't receiving the emails. difficulty reaching support to resolve issues, and escalating costs. I can create beautiful emails that match my site design in a very short period of time. On average it takes me 15 minutes to create a new email campaign. I am spending less than half of what I used to to send out my emails. This is huge for me and was a big reason why I switched. I was really tired of spending hundreds of dollars each month on email marketing, and now I'm not! I don't have to know coding to produce an email. You set up a template once and can copy a previous email, change the content and you're done. I'm not charged extra "add-on" fees to access archieved emails or upload and save photos. I get just what I need without paying for extra services such as "free seminars" that I never used. I was able to easy move my previous email list from Constant Contact to Robly without my subscribers having to re-opt in. They never realized that I had switched email companies except I received compliments as to how much more attractive my email campaigns looked. Since I had written so many emails in Constant Contact I found I was able to put that service on an inactive status for $5 a month and still be able to access the content of previous emails if I needed to. I may end up cancelling this but I do have evergreen content in some of my previous emails and it was a bit of a security blanket for me to do this. It's really easy to change the size of a photo, increase the padding around a photo, and add links. The templates are set up like a word processing program so you just have to drag elements in or type your content. How much is too much and how much is too little. How often you send out your newsletter may depend on your time and the type of information you need to communicate. 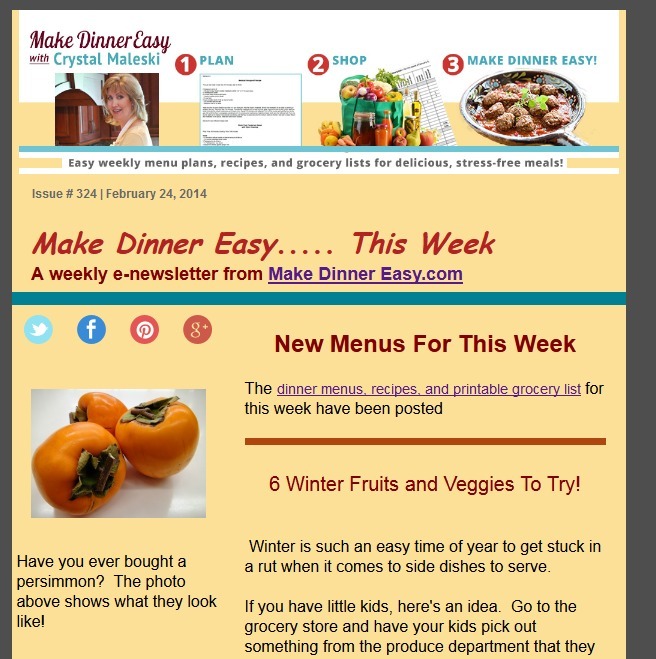 For me, weekly is the right answer as I publish new dinner ideas each week. Most bloggers and businesses that I interact with send out either weekly, bi-monthly, monthly or sometimes quarterly emails. The key is consistency. I also found it helpful to poll my readers as to which day they preferred to receive their emails. I thought Firdays or Saturdays would be best so people could do their grocery shopping over the weekend but my readers told me that Mondays were better for them, possibly because they normally opened their emails at work. When in doubt ask! Having a consistent Look and Feel across all of your platforms is important. Using the same color scheme, logo, fonts, or graphics helps you establish a consistent identify. My newsletters have the same look and feel as my site. One of my previous campaigns featured info on Winter Fruits and Veggies to Try. As you can see from clicking on the link to that archieved copy or viewing the portion shown below, it looks quite similar to my site page. It sure doesn't look like a typical email and using Robly I was easily able to upload my header image and select background colors and font colors that were consistent with those used on this site. My advice is to be purposeful with your content. Give your readers a reason to open your emails or they won't. Even worse, if you provide unattractive or overly-salesy newsletters they may report them as spam or unsubscribe. I suggest brief emails that can be easily scanned on a smartphone, read quickly, and that contain really helpful or valuable information. Of course you can include a link to a product but make it more than just a sales pitch or you may loose a subscriber. The title of your email matters as well. Think of something interesting that would make someone open your email. I've had success with numbered lists such as "6 Ways to Ruin a Pot Roast" or "4 Things to Remember When Roasting a Turkey". I think by having a numbered list it also gives people an idea that this won't be a long-winded email. Email Marketing is a fantastic way to keep in touch with customers and followers. It allows you to keep your company or website in front of your followers and can help you drive traffic to your site, your social channels, and provide valuable information to those your want to connect with on a regular basis. share or +1 this post below! 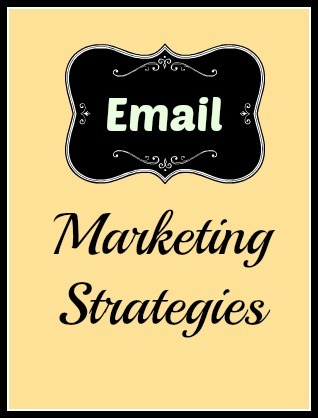 Do you have any additional strategies for email marketing? Feel free to add them to the comment section below!